Obviously, this isn't a real game, but I've never seen anything like it or about it anywhere else. It seems to be really well-made, though, the cartridge molding and label design seem on par with official GBA games (Other than the title, of course). So does anyone have any idea of what it is? Here's the eBay listing if you're interested. There was an official Star Wars: Episode 3 game but I wouldn't be surprised if it were one of those Sintax platformers that got hacked and re-hacked a billion times. Never saw a cart of this thing before! By any coincidence, is AGB-ALYH-USA an original code, or does it match that of a (presumably unrelated) USA licensed game? 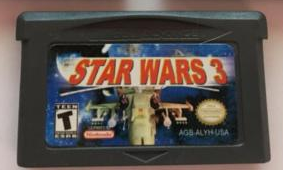 Maybe this "Star Wars 3" is just a re-release of another Star Wars game. They really tried hard to make it look like a real USA game, with seal of Nintendo, "Licensed by Nintendo", E.S.R.B. "T" rating, and even the code I mentioned. The public-domain ROM that they stuck on the cart is named Star Shooter, incidentally. Edited to add: At least I assume this is the same Star Wars 3, anyway. I doubt there'd be two GBA bootlegs using the same title (but one can never be truly sure!). I guess it wouldn't be the first time we've seen two bootlegs using the same name, but that's extremely rare. Damn, I was hoping for a pirate original of some sort - It feels like every stone has been turned on that front!